Let’s start out with what to listen for in a recording location. Naturally, we’re always going to be looking for a space that isn’t going to introduce too many environmental and human generated artifacts into the recording, but the physical layout and acoustic properties of a location can contribute as much character to your recordings as microphone selection…sometimes even more. On top of that, recording vehicles and weaponry (what you’ve specialized in) isn’t something you can do just anywhere. So, what do you listen for when scouting potential recording sites? The biggest problems I face when searching for a recording location is traffic, especially airports and expressways. I’ve scheduled multiple jobs where I had to find ideal locations away from these environments. Fortunately I live and work in a quieter area away so I don’t have to travel too far. However, that rare Ferrari I need to record is located in the middle of a downtown so it’s crucial to make generous car owner friends who are willing to drive an hour or so to a quieter location. Most microphones I’ve tried are quite sensitive in capturing unwanted background sounds. This is why I often use my Sennheiser MKH-418s M/S shotgun mic. For isolation with a mono mic I use either my Neumann 82i or the Rode NTG8. On bigger budget jobs I will rent the Neumann RSM-191s mic (probably one of the best field recording mics ever made). For weapons recordings I often rent out my favorite shooting range in the middle nowhere Florida. At this private 300 plus acre location, you CAN NOT hear traffic and will only hear planes a few times per day. The recent launch of my FullAuto rifle sound effects library was recorded there. Another problem I sometimes face is “over reflection” from buildings and other objects. Whenever I’m at a new location, I’ll have a shooter do some shots for me so I can listen for ideal microphone positions. My ears are briefly covered by my fingers then released right after the initial shot. This process is repeated until the desired positions have been heard. While mono mics can be faced in many desired directions, stereo and surround mics are my biggest concerns. These mics to be evenly leveled according to the location so that both left and right channels sound alike. Then there’s the whole volume issue. What strategies do you use when recording sources that you really shouldn’t be listening to without hearing protection? How do you implement on-site quality control? Whenever I need to record ear piercing sounds, I always use my Remote Audio HN-7506 headphones. This thing is built to block high decibels from gun shots, jets, helicopters, and monster race cars. After recording the painfully loud GT race cars like the Corvette CR06, I knew I had to buy this Remote Audio headset to protect my ears. They allow me to monitor while I’m recording so I can quickly make level changes and also detect other problems. 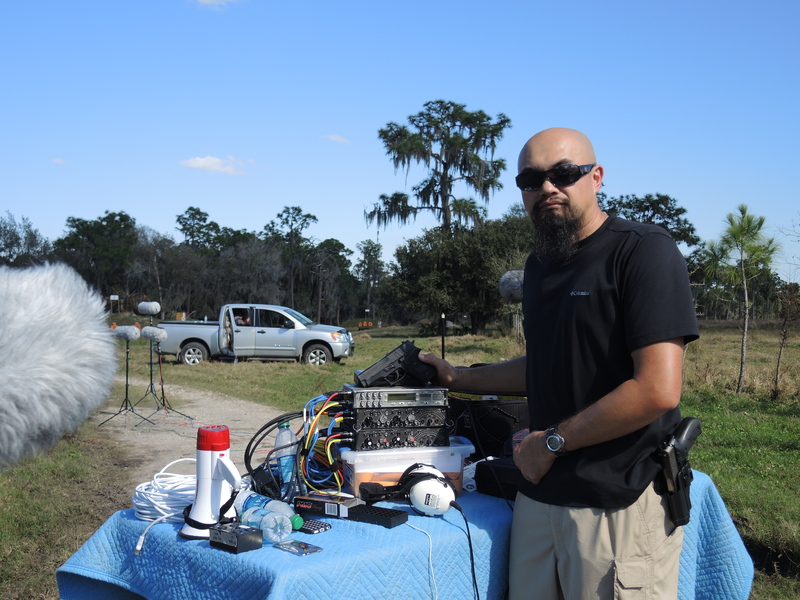 I also use Sound Devices 442 mixers to control sounds that can distort the inputs for the field recorders. The analog limiters from Sound Devices are the best to handle what seem to be out of control loud sounds. Whenever I am contracted to do large scale weapons sessions, the 788T is another blessing to have. The headphone preamp is the best I’ve tried and the rotatory knob can allow for quick monitoring for each of the 8 channels. I imagine it’s also a bit different when you’re working on high channel count recordings sessions…10, 15, 20, etc.. Obviously, mics that are more distant from the source are safer to audition in real-time than those that are closer. You could also lose a lot of productivity constantly cycling through each channel that way while on location. Where do you come down on that conundrum? Are you selecting a few mic placements to focus on that you feel are representative, or are you more fastidious in your approach? From my experience, there aren’t many shortcuts to the craft of field recording guns and cars. Yes there are mics that do consistently work well where others do not. Every so often I will bring with me a few firearms to the range and test out mics with my Sound Devices mixers and recorders. My goal is to find out if they can handle close, medium, etc mic positions from the shooter’s perspective. Once I have a thorough listen of the tested mics, they then might be added to my bag of trusted tools. The most valuable positions I listen for are close and medium distances. The clients I have want three or more mics per perspective for more creative options during mixing. Believe it or not but many microphones can handle the pressure from gun shots, even from a foot away. It’s a matter of what you’re plugging the microphones into (mixer and/or recorder). Some of the mics I’ve tried are what I call Prozac Mics. They sound great one second then horrible for many hours. The ones that made it into my bag of trusted tools list are fantastic! I sometimes think tank parts were used to build these hardened microphones. They work so well that I often don’t have adjust the levels so I can concentrate on the more sensitive mics. With me are also Shure mic pads that can cut off as much as 25dB. These are great for the more sensitive mics. It’s crucial for me to do these tests on my own time so I don’t have to experiment while working on medium and large budget jobs. There’s just isn’t enough time to do so when you have limited day light while rolling 12 to 20 plus channels. You’ve done a lot of “work for hire,” but this Full Auto library is your first that’s commercially available. As I understand it, you’ve done some mixing of microphone perspectives to create composite sounds. How was that process different from your typical work where you’re delivering the “raw” tracks? What is it that you want to hear and feel from a finished file that prompts you to combine multiple channels into a finished effect? From working with multiple groups such as film, TV, and video games, I’ve done jobs from just what was needed according to the picture to a vastness of close mic position of 6 inches from the shooter, to far distance of over 600 ft away. With a steady stream of requests to sell copies of my sound effects, I finally wrote a plan to record and edit an overall full automatic rifle sound effects library. I covered different shooting modes such as single shots, short burst shots, and mag dumps (magazine dump is when you hold back the trigger to shoot out all of the rounds until the rifle’s magazine is empty). We selected four rifles of various calibers so that they would sound different from each other. The microphones from 10 total channels were placed in perspectives such as close, medium, far, as well as incoming (the sound of an enemy shooting towards you). I purposely did this so that a labeled far distance file sounds like a far distance sound (not processed from a plugin to make it sound like a far distance gun shot). This library of 450 sound files is a teaser of what the potential is, like large scale 20 plus channel recording sessions of all types of weapons including explosions, bullet impacts, whiz bys, and ricochets. The project has been successful to meet many of my clients’ needs. When a person’s project only has sniper rifles, the library for example has single shots to fulfill their needs. There have been other requests from various clients so more libraries will be released.